LADIES' STREET COSTUME – Continued. 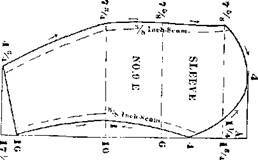 Use the scale corresponding with the bust measure to draft the waist and sleeves. It consists of nine pieces. 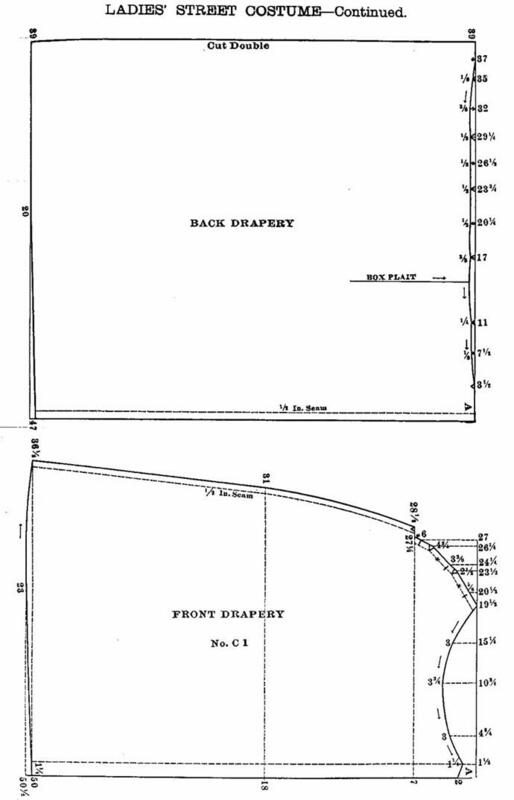 The blouse consists of front and back yokes, shirring for front and back, cuff, and three sleeve portions. Gather the front and back por­tions, and sew to the yoke: also gather the lower edge and sew to under waist. If made to wear during the warm season, omit the under waist; simply gather and sew to the skirt; bind the seams underneath to keep it in place. Gather the full sleeve at the top and bottom, and baste on the tight sleeve at the top and bottom. 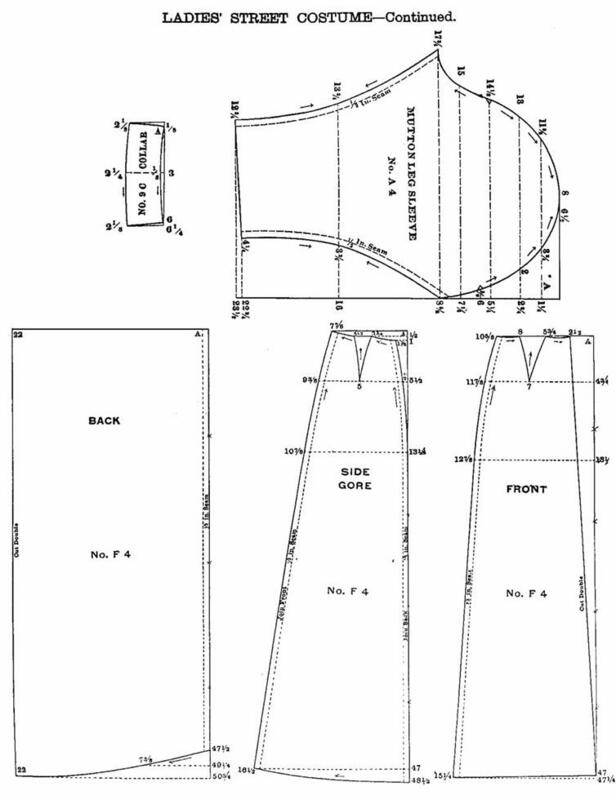 The skirt is drafted by the waist measure. Regulate the length by the tape measure. CHILD’S BLOUSE COSTUME – Continued. 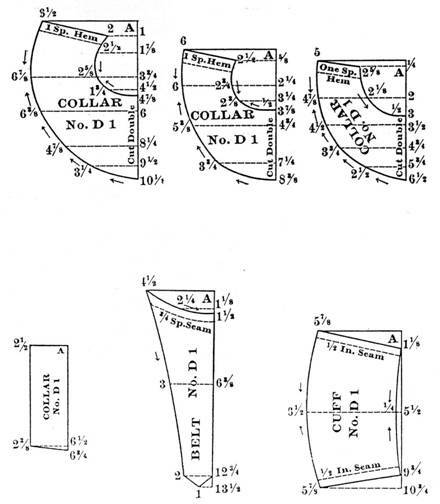 Use the scale corresponding with the bust measure to draft the entire cos­tume, which consists of Front, Back, Side-Back, Sleeve, Cuff, Belt, and four Collar pieces. Lay pleats in the back and front according to the notches, turn the pleats toward the center, stitch each pleat down as far as the notches; press carefully. Sew the belt in the under­arm dart. Gather the sleeve at the top between the notches, and sew in the arms eye. Gather at the bottom and sew on the cuff. It would be bet­ter to make a tight lining. 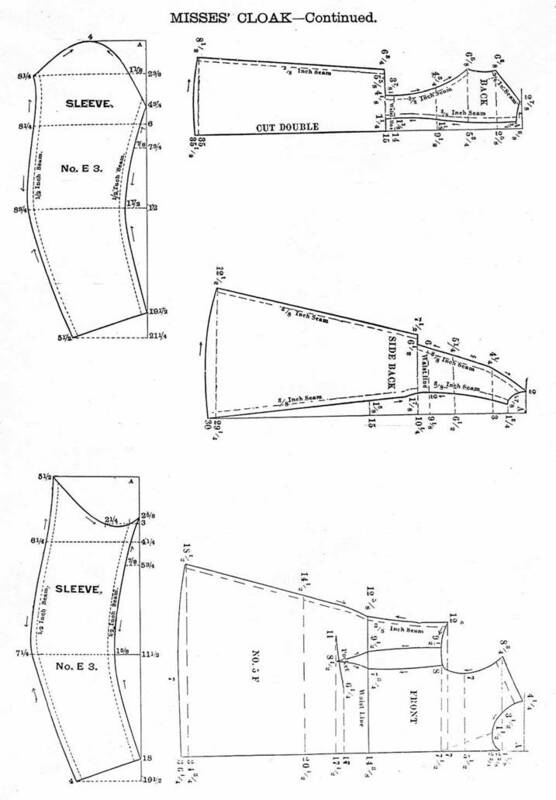 Cut from any of the tight sleeve patterns. The three collars, or capes, are faced with silk. This makes a very stylish looking garment, as well as comfortable. Regulate the length 'by the tape measure. Use the scale corresponding with the bust measure to draft the jacket, blouse, waist, and also the under-waist. The jacket consists of five pieces: Front, Back, Col­lar, and two Sleeve portions. Finish the bottom of this with a very fine silk cord. 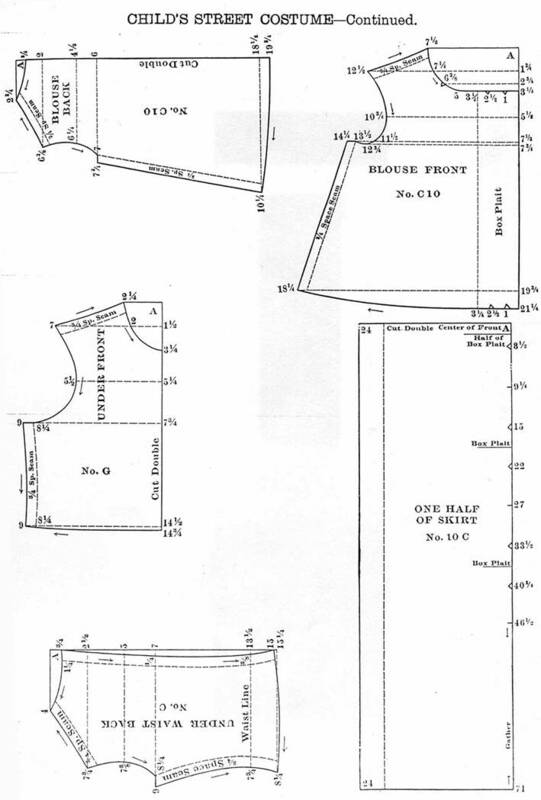 The blouse waist is in four pieces: Front, Back, Sleeve and Cuff. Gather the front to fit the neck, face the bottom, and insert a rubber cord. 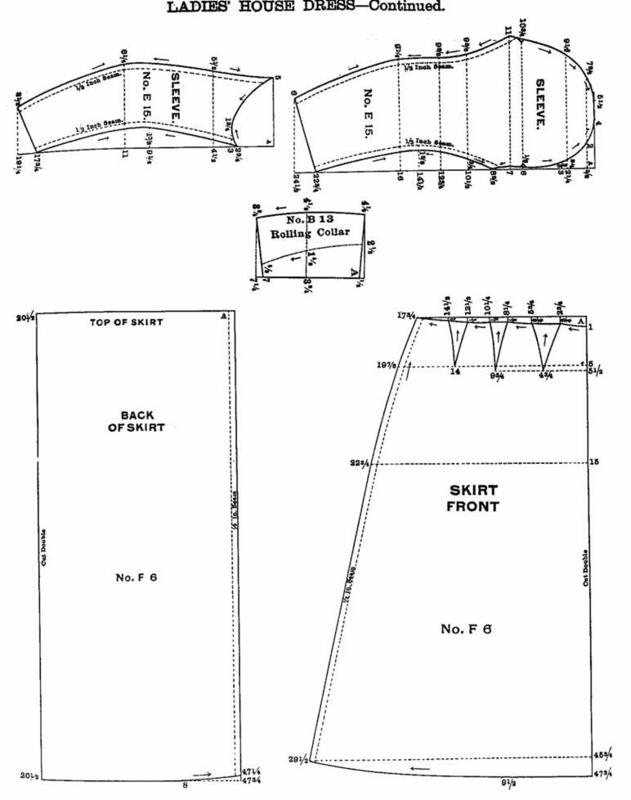 The under waist is in two pieces: Front and Back. Close in the back with buttons and button-holes. 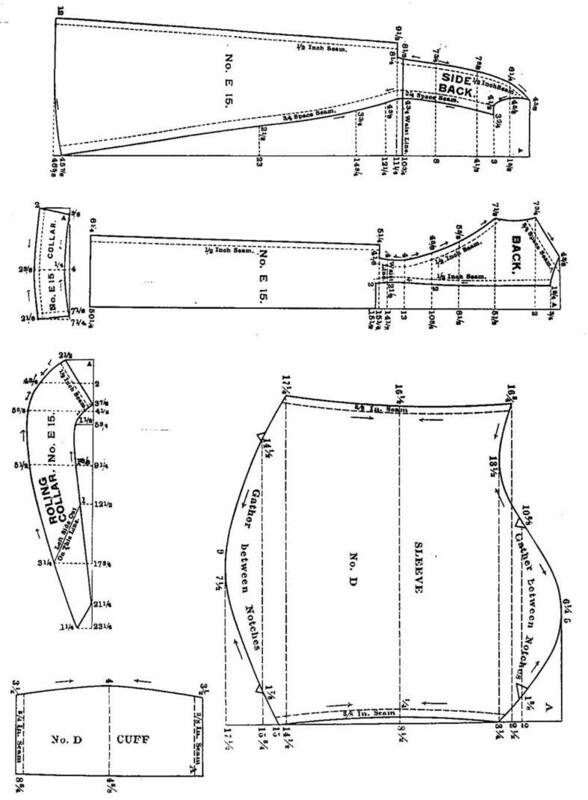 The skirt is drafted by the scale corresponding with the waist measure. Lay the pleats according to the notches. Press carefully and sew to the under-waist. Regulate the length by the tape measure. Use the scale corresponding with the bust measure to draft the waist and jacket. The waist consists of Upper and Under Front, Back, Side Back, and Under-arm-gore. The full front is simply turned down at the top and shirred one or more times. Gather the bottom between the notches and join to the under front at the under arm and shoulder seams. Finish the bottom of the waist with a pointed or rounding belt. The sleeves may be made of the same material as the waist, if preferred. The Jacket consists of two pieces: Front and Back. Make it as long in the back as the waist can be made, of velvet or lace. The drapery is given on page 14. 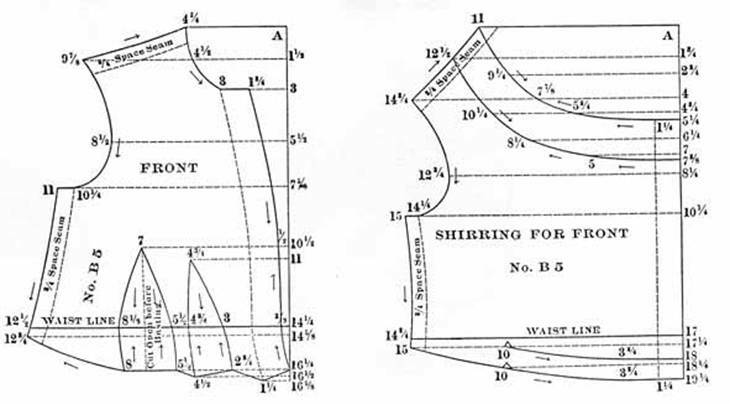 Draft out by the scale corresponding with the waist measure. Is in two pieces: Front and Back. Lay the pleats according to the notches; make it as long as the skirt. 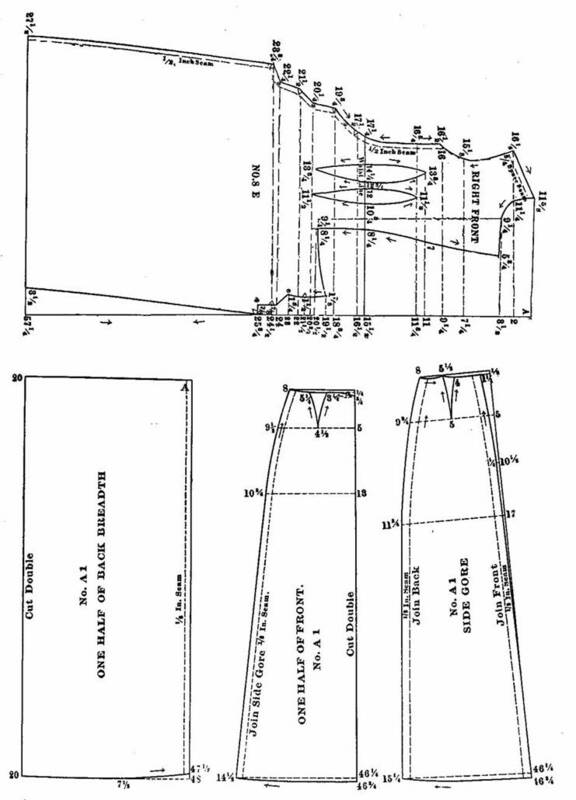 Draft the skirt from any of the plain skirt patterns given in this issue. 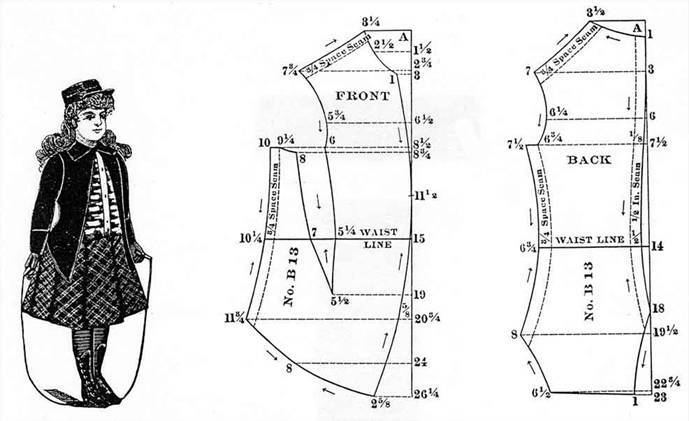 Use the scale corresponding with the bust meas­ure to draft entire basque, which consists of front, vest, back, side back, rolling collar, cuff and sleeve. 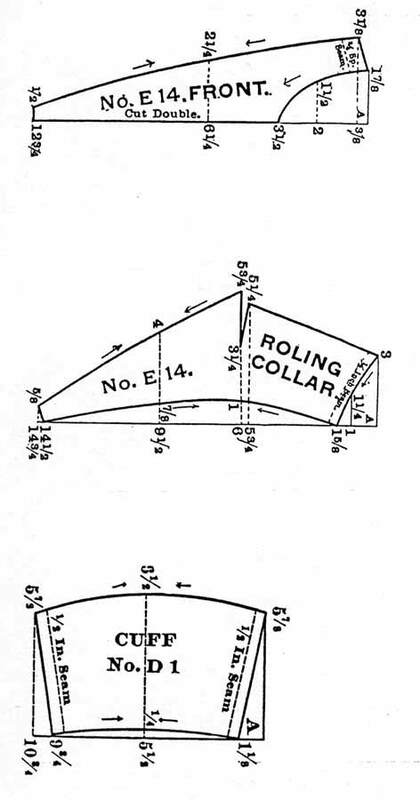 Sew rolling collar on the line running from 5, on top line, down to 1 3/4, on the seventh cross line. Sew the vest in; close with hooks and eyes. If the front is to be made as represented here without darts, cut the lining from the front given. Cut the outside on the bias and stretch it to fit the fig­ure perfectly. Finish all around with a fold or heavy cord. 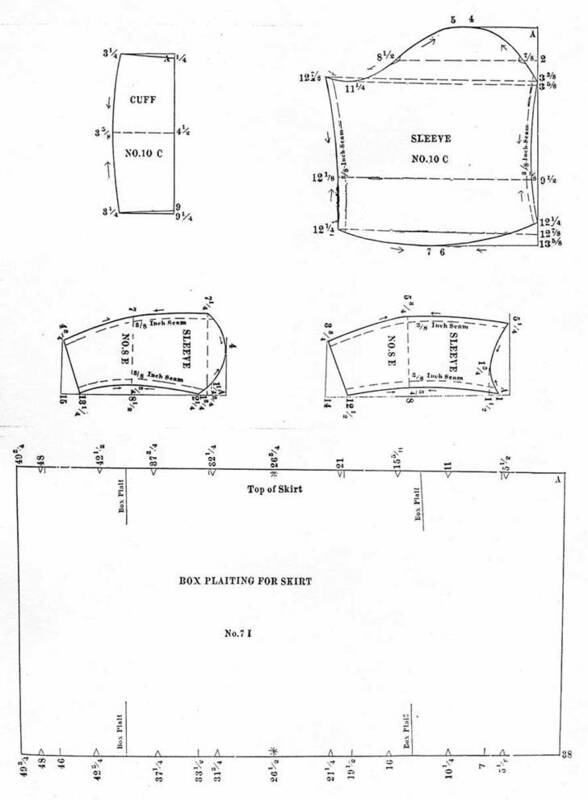 The diagrams for the pleating of the skirt is given on page 16. 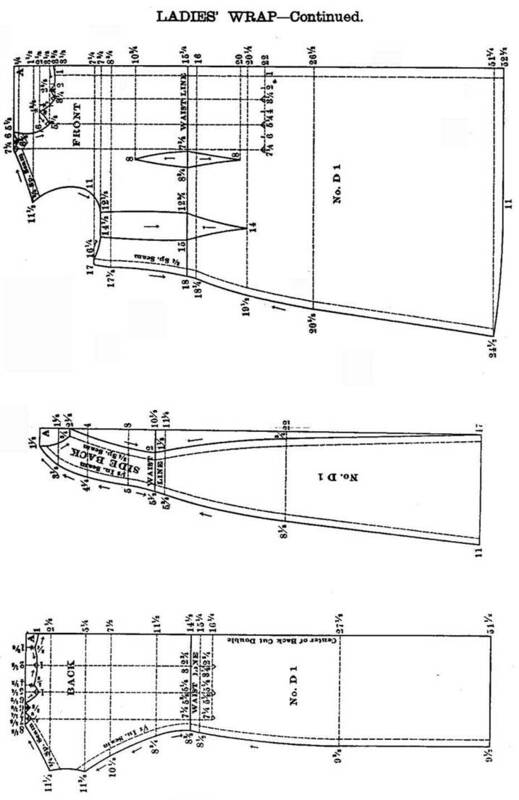 Draft by waist measure. The foundation skirt is given on page 17. 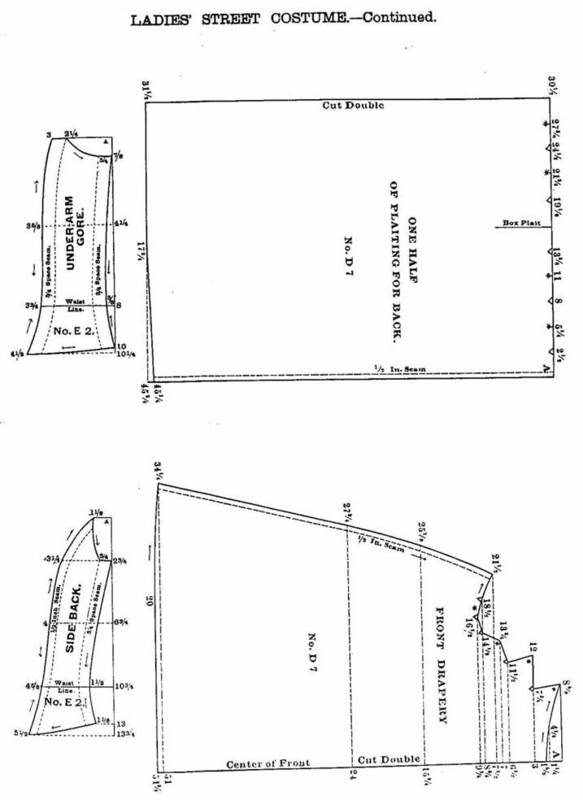 Draft by waist measure also. Regulate the length by the tape measure. 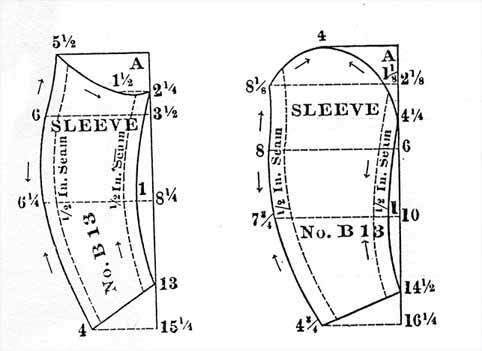 Use the scale corresponding with the bust measure to draft the entire gar-ment, which consists of front, back, side-back, two sleeves, cuff and three cape portions. Draft the same as all other garments} put the parts together as they are marked, take up the dart on the shoul­ders of the cape. Make of any suitable material. 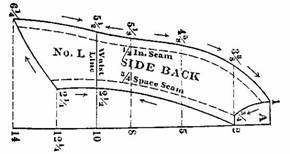 Use the scale corresponding with the the bust measure to draft the entire gar­ment, which consists of front, back, side back, collar and two sleeve portions. Lay the pleats in the back according to the notches. Close in front with hooks and eyes; trim the foot with a pleated ruche, made of the same material as the dress. This may extend just across the front or all around. Regulate the length to suit. 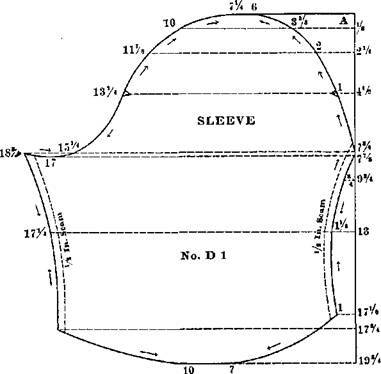 Use the scale corresponding with the bust measure to draft the waist and sleeves, which consists of front, back side-back, under-arm-gore, collar, cuff and three sleeve portions. Cut the bot-tom as represented. Trim same as the skirt, close in the back, with buttons and button-holes; cut the lining for the sleeves from the smaller patterns. 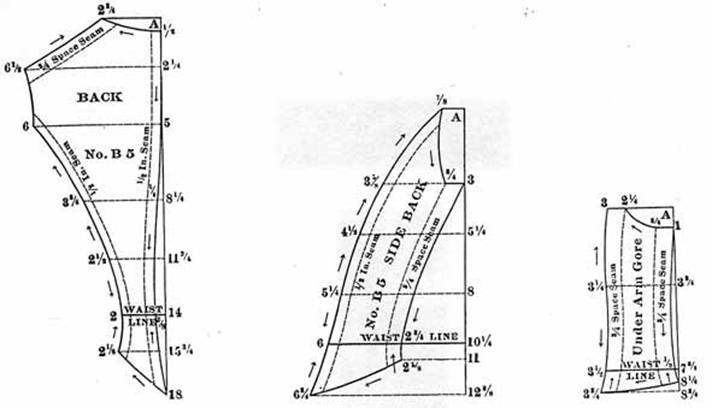 The skirt is drafted by the scale corre­sponding with the waist measure; lay the pleats according to the notches. Regulate the length by the tape meas­ure. 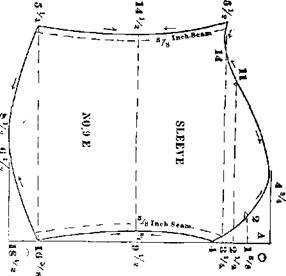 Use the scale corresponding with the bust measure to draft the entire garment, which consists of front, back, side back, col­lar and two sleeve portions. 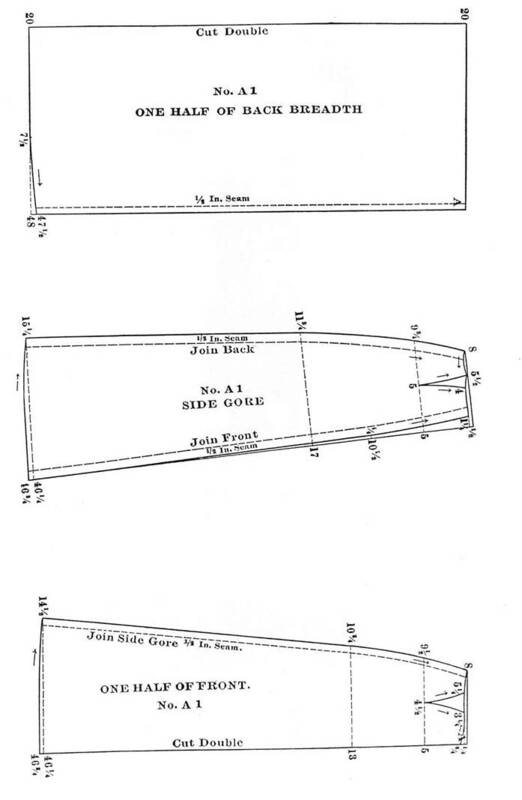 Cut on the in­side line for the left front and the outside line for the right front. Trim with fur or astrachan. . The polonaise, given on page 26, is drafted by bust measure. 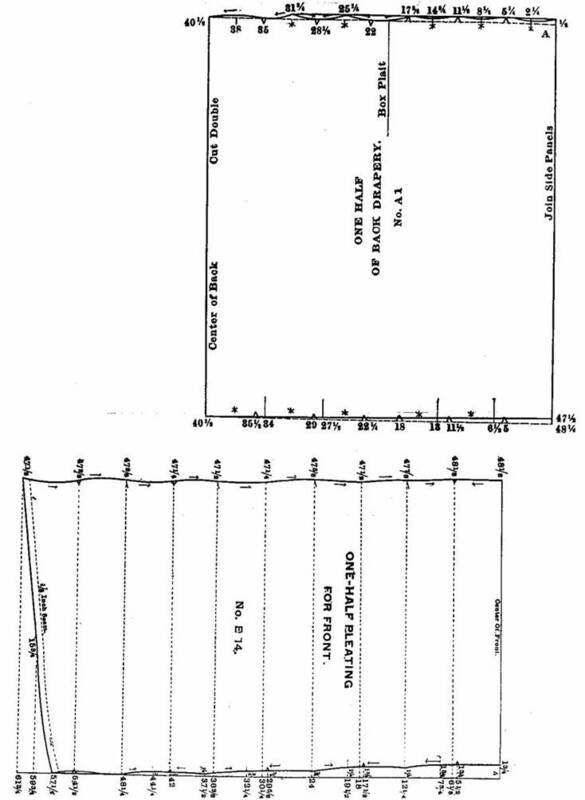 It consists of right and left front, back, side back, under-arm-gore, cuff and sleeve, which are given on page 25. Lay the pleats in the front according to the notches; lay two double box pleats in the back; trim as desired. 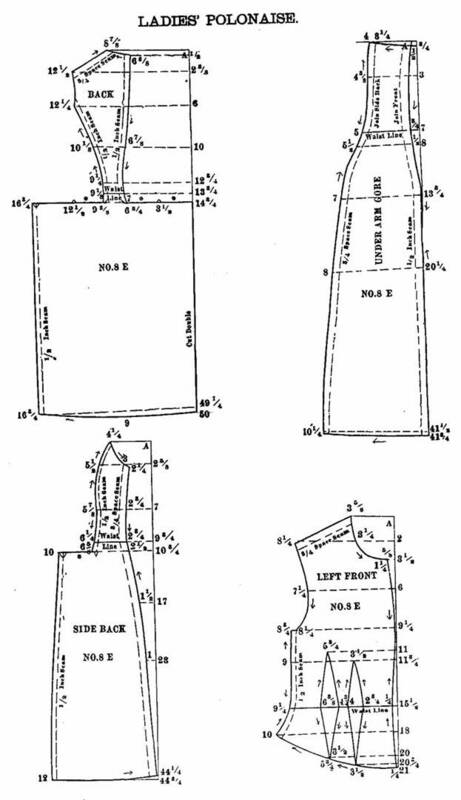 The skirt is drafted by the waist measure and is in three pieces: Front, back, side gore. Regulate to suit. 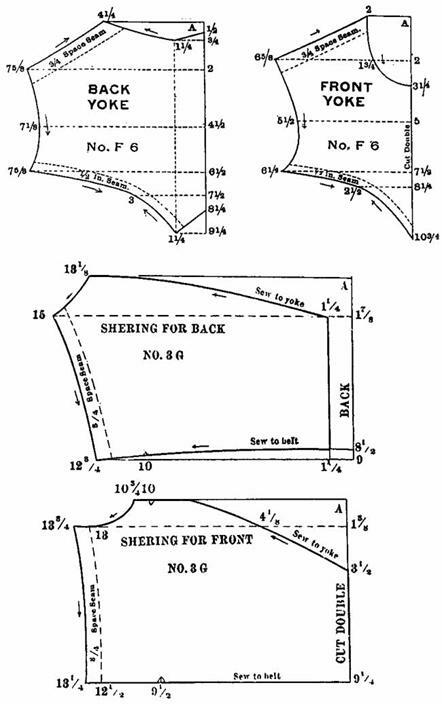 Use the scale corresponding with the bust measure to draft the basque and Sleeves, which consist of front, back and side back and sleeve. This is a straight, round basque with diagonal front. 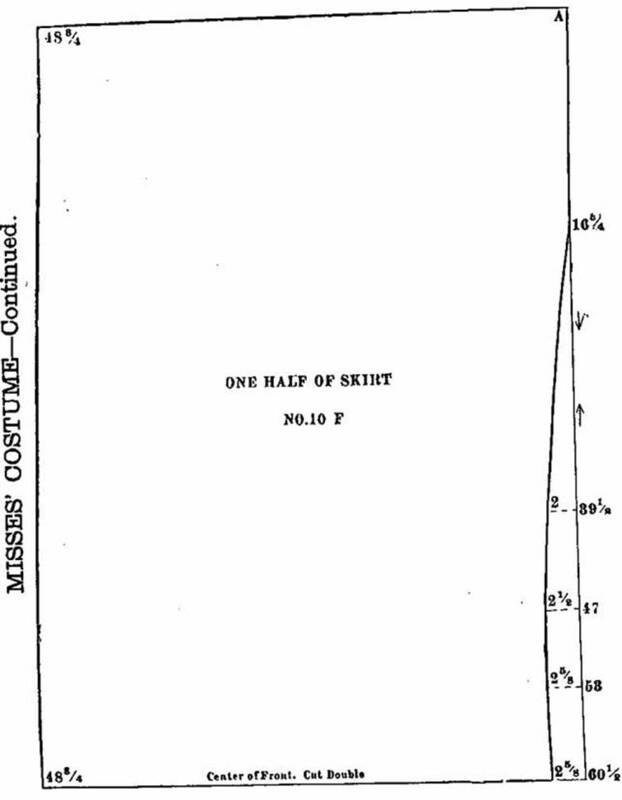 The skirt is given on page 29. Draft by the waist measure; is in one piece; gather very full in the back. Any style of trimming may be used. Regulate the length by the tape measure. 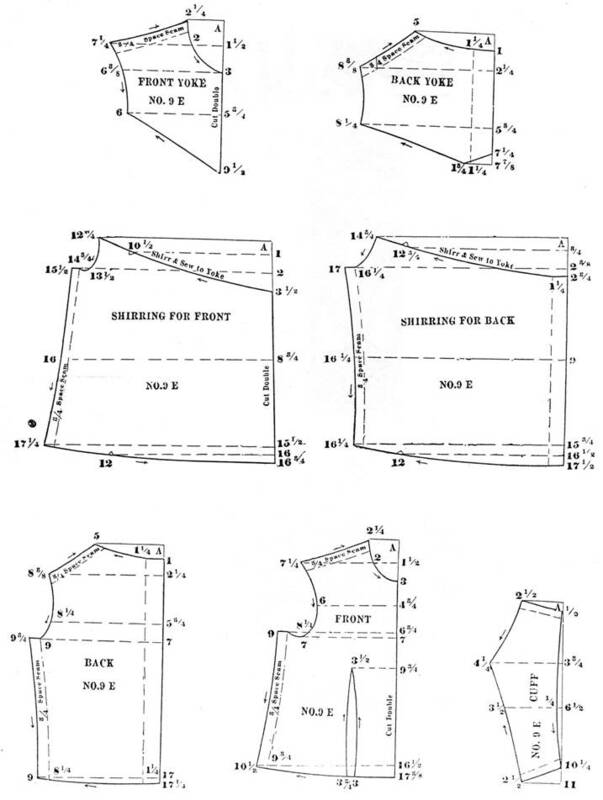 Use the bust measure to draft the basque, which consists of five pieces: Front, back, side-back, under-arm-gore, and sleeve. This basque gives the bias effect. In cutting the front lay the front edge of the pattern on the straight edge of the goods, which will bring it bias under the arm.. 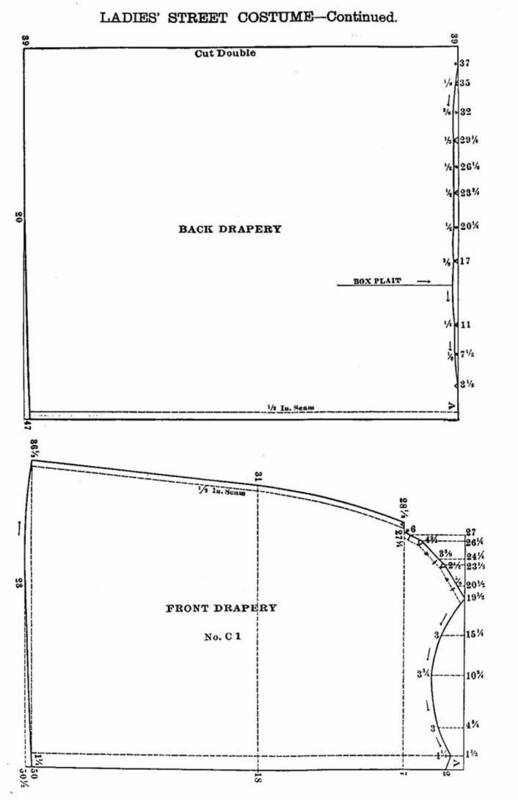 The skirt is given on page 31- Draft by the waist measure; is in two pieces, front and back. Lay the pleats in the front according to the notches, lay the back in two double box pleats, cut the foundation skirt from any plain skirt pattern, trim the bottom of the skirt with pleating, vel­vet, astrachan or braiding. Regulate the length by the tape measure. Use the scale corresponding with the bust measure to draft the entire waist, which consists of upper and under front, upper and under back, side back, under­arm-gore and two sleeve portions. Cut the entire costume on the bias. Lay the pleats on the shoulder according to the notches. Close the under front or lining down the center of the front. Face the upper front on the left side from the neck to the waist, and close with buttons on the left shoulder and uuder the arms. Finish bottom with a velvet girdle or velvet ribbon, with a bow and long ends in the back. The skirt is in one piece. 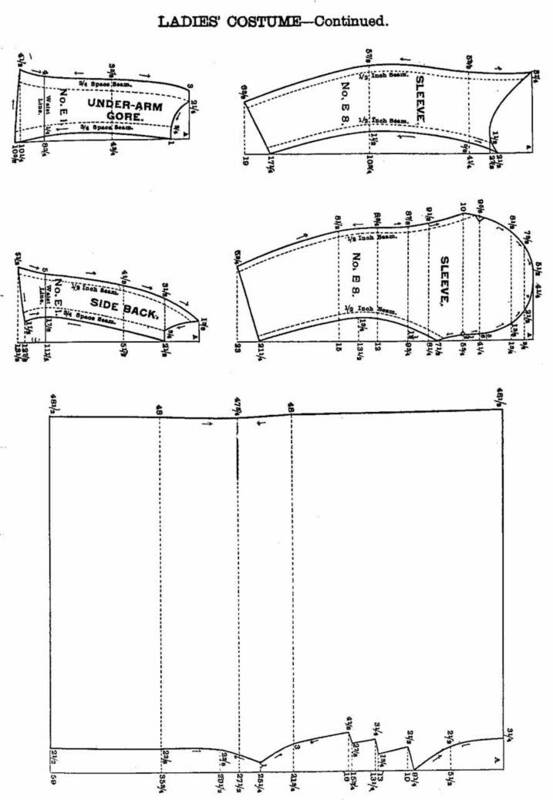 Draft with waist measure. Lay the pleats in front according to the notches; gather the back very full and sew to the waist. Use the scale corresponding with the bust measure to draft the entire coat and under waist. The coat consists of front, back, collar and two sleeves. The under waist is in two pieces, front and back. Draft this the same as all other garments. Finish the edges of the coat with a binding or stitching. 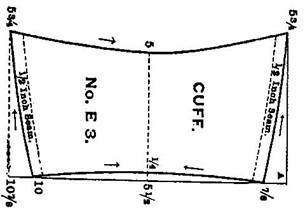 Draft the skirt by the waist measure. Lay the pleats according to the notches, one large box pleat in the front and smaller ones in the back. Press care-fully and sew to the waist. Regulate the length by the tape measure. 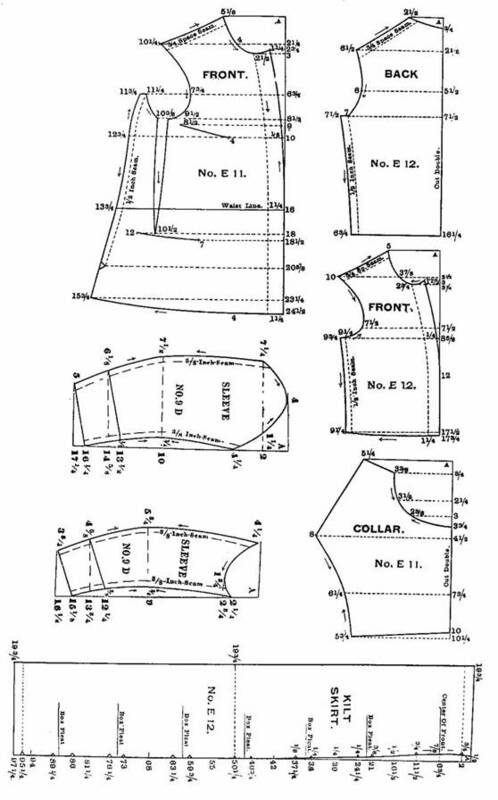 Use the scale corresponding with the Bust measure to draft the entire Basque, which consists of Front, Back, Side-back, Under-arm Gore, Collar and Sleeve por­tions. Any style of trimming may be used on the waist that is desirable. If made of large plaid, no trimming is required. Gather the sleeves very full just on top. Put a layer of wadding on the upper part to make it stand up nicely. Cut the sleeves on the bias. The drapery is given on page 37. 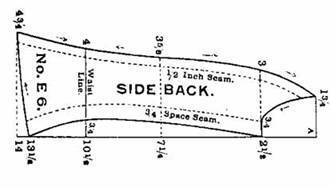 Draft by the waist measure. Is in two pieces, front and back. Make the pleats on the front to come on the right or left side, just to suit the wearer. The back is laid in two double box pleats. 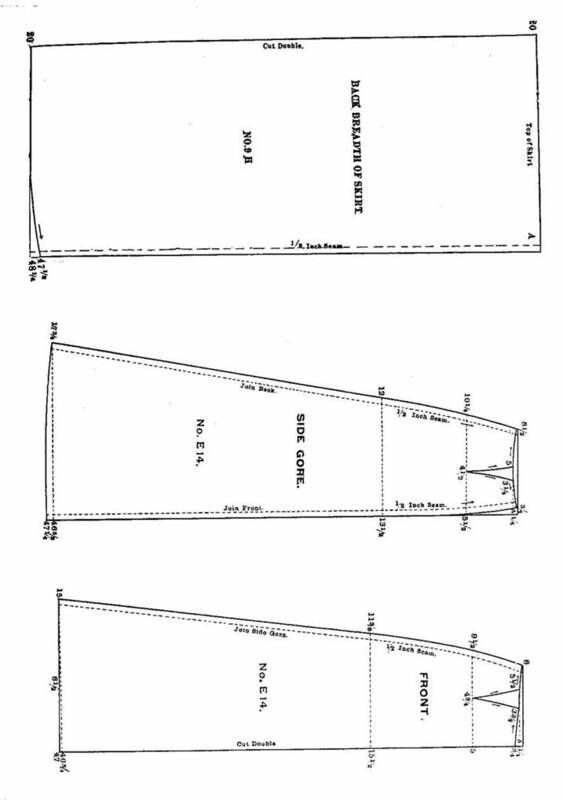 The diagrams for the underskirt are given on page 36. 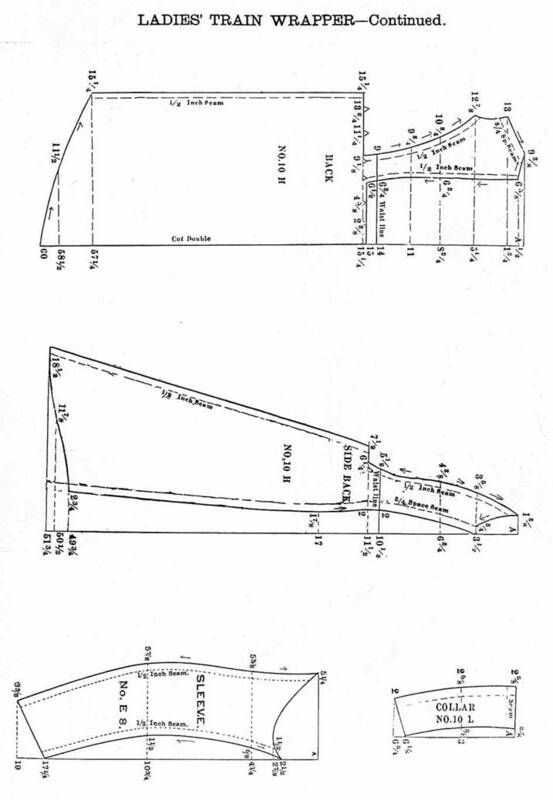 Draft by the waist measure. Trim to suit. Regulate length by the tape measure. to the yoke.Gather the bottom between the notches and sew to the belt. This may be made to open in the back for a miss or in front for a lady. If it is made to open in front take the hem off the back and cut the goods double, and allow the hem in frnt 1 1/4space hem.Gather the sleeves at the top between the notches. Draft the skirt by the scale corresponding with the waist measure, it consists of front and back. Take up the darts in front, lay small pleats in the back turning toward the center of the back. Do not make the back over 6 inches wide after it is all pleated. Trim the bottom to suit. Regulate the length by the tape measure.